Ever since then, I've always gravitated to Young Adult stories. It's such a dramatic time in a person's life when important decisions are being made, and so satisfying to write about. My life is not glamorous. At all. I work almost every day, and only in recent years have I made enough money to comfortably pay for three days of preschool for my youngest son. I get a lot of emails from people who think I don't answer my own emails because I'm famous, and things of that nature, and they always make me laugh. I absolutely answer my own emails, and clean my own toilets, and wash all of my family's laundry, and so on and so forth. I learned that I'm responsible for making learning fun. You can't count on a teacher to summon your enthusiasm, you need to bring that to class yourself and find ways to keep your mind engaged. If you do that, you'll keep learning amazing new things your entire life. Did you learn anything from writing Romeo Redeemed and what was it? I learned that you can't force a character to be something that he's not. I had to allow Romeo to be a rascal. Only then was I able to write a transformation that rang true for me. For those who are unfamiliar with Ariel, how would you introduce her? She's a damaged girl (scars on her skin and emotional scars) who's been a victim all her life. She comes off shy at first meeting, but she's got a lot of anger simmering just below the surface. That anger is her biggest weakness. What part of Romeo did you enjoy writing the most? I loved writing the romance. Seeing this bad boy fall deeply and unselfishly in love for the first time was so sweet. I think she should spend some time with Megan Berry from my YOU ARE SO UNDEAD TO ME series. Megan is such an outgoing person and always ready to make a new friend. I think she'd be good for Ariel. Patrick Ness. I aspire to write novels as un-put-downable as his KNIFE OF NEVER LETTING GO trilogy. OF BEAST AND BEAUTY, my next release--a twisted retelling of Beauty and the Beast due out in Fall of 2013--will be my ninth novel published as Stacey Jay. Writing advice? Read, write every day, revise, and repeat. Reading advice? Try a little bit of everything, there are good books out there in all genres. I only lie to protect the innocent so I can't really say. Working at Paco's Mexican Grill when I was a junior in high school. I smelled like salsa and fried onions all summer. Losing my children. I don't know how parents survive the death of a child. Parents should go first. I'd choose love with heartbreak. Love is worth the hurt. My husband, and then my friend Julie, who always has hilarious and very Southern words of wisdom to share. Where can readers stalk you?Lol! Great question. Thanks so much for the interview, Jean! And thanks to my readers for their support. It means so much. 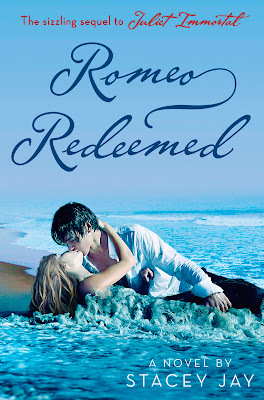 Stacey Jay’s Romeo Redeemed is the second book in the Juliet Immortal series where Romeo and Juliet are not lovers, but rather enemies. When the merciless Romeo is eternally cursed, he is given a second chance to travel back in time and redeem himself. He has to save and win over Ariel Dragland who holds the fate of the world in her hands. His seduction is nothing but a plan to lure her away from her impending gloomier side. After Ariel believes his love is a sham, the influence of the Mercenary becomes stronger and it may finally lead her to a path of darkness. This alternative reality for Romeo is nothing anyone would ever expect from this classic tale. Juliet Immortal was definitely a wild twist and Staceycontinues her creative imagination with this enthralling adventure. This book is highly character driven and readers will learn more about Romeo. The real Ariel is introduced as being vulnerable and easily receptive to getting hurt but readers will see her mature into a stronger person as the story progresses. Their romance reminds us that love is powerful and it is the one thing that will keep pushing you forward even when you think you cannot go on. Romeo Redeemed is a magical love story with epic adventures from a unique take on the Romeo & Juliet tale. Intensely addicting, readers will take nothing but satisfaction from this book. Thank you Stacey for making this giveaway possible. 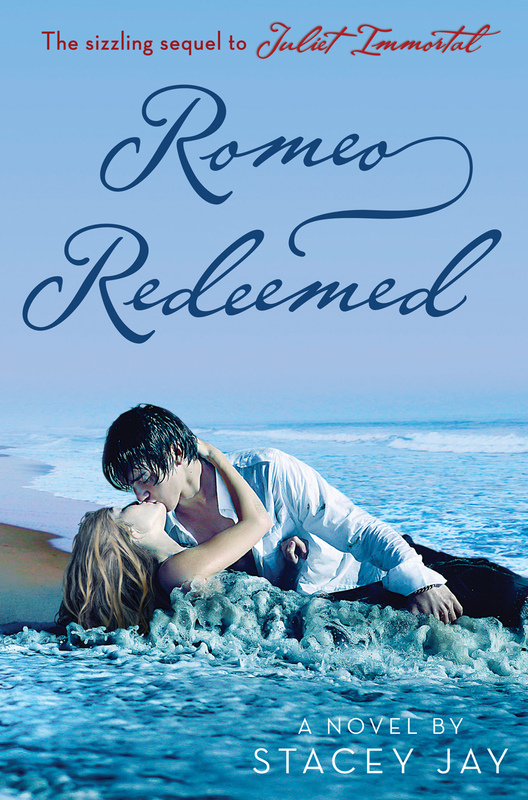 1 Winner will receive a Copy of Romeo Redeemed by Stacey Jay. Thank youuu so much for this chance!!! I can't wait to read this book. I loved this Romeo in Juliet Immortal!! Thank you Stacey and Jean for this awesome giveaway! Love is definitely worth the hurt!! Thank you for donating your book for this giveaway!!! I am so looking forward to reading this and the first book of yours!!! Thanks for the giveaway! I have been wanting to read this! Thank you very much for this wonderful giveaway!!! Thanks so much Stacey! I've been wanting to read the first one too, so thanks for the giveaway and a chance to win the sequel! Thank you Stacey for the donation! Thanks! I love the first book and looking forward to this one!